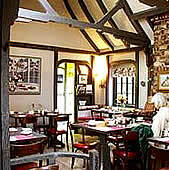 The Tuck Box Tea Room, Carmel, California, USA - GourmetVoyageurs.comk high end food & travel e-magazine. "The Tuck Box" is named after the small wooden lockers English school boys took to boarding school with them to hold their toys, books and food (tuck). The "tuck box" has always had a warm and special place in British student hearts since the food served in their dining rooms was so execrable that the candy and cakes hoarded in their boxes were the only things to satisfy young tastes. This name-sake more than lives up to these expectations. I know, I went to English boarding schools in the 1950's and cherished the goodies in my tuck box! All of us who have been eating at the Tuck Box owe a debt to Zigmont J. Le Towt and his wife Dianne who saved the Tuck Box from disappearing in 1996 when the previous owners just had to withdraw from the business. They are keeping this living piece of Carmel history and tradition alive and flourishing. 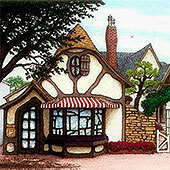 The Carmel incarnation is a whimsical environment more out of a book of fairy tales than the real English countryside. But never mind. It is quaint and has charm. 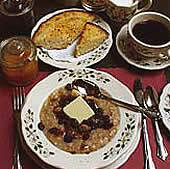 Certainly a better place to eat hot scones dripping with butter and heaped with the Tuck Box jam, hot cereal, good Ceylon Supreme Pekoe Black Tea, eggs and bacon or Canadian Bacon not to mention the stewed prunes. Breakfast digested, you can then look forward to Welsh Rarebit, Shepherd's Pie, Beefsteak Pie, Meatloaf with mashed potatoes (not a typical English dish but fulfilling in the same "nursery food" way). Or on Saturdays the English Pot Roast steeped in herbs and red wine with mashed potatoes. Desserts are listed as "desserts of the day & homemade pies served with real whipped cream". Don't eat here if nonfat is high on your dietary priorities. The pies see service later in the day for Afternoon Tea along with the Scottish scones, cheese and fruit plate. The Tuck Box does not serve dinner but after what you have just consumed from the time you arrived in the morning, who needs dinner! Besides, English school boys were not served dinner, just late afternoon tea. They do serve local Monterey County wines by the bottle or glass as well as Carmel Brewing Co. and English bottled beers. A note on their Scottish Scones. These are not the small scones you may be used to. These are large, about the size of a salad plate. The Tuck Box recipe is from northern Scotland and is lighter in texture than the scones found in England. Scones trace their ancestry back to the 1700's in England. Their quick preparation in contrast to yeast rising breads and the large number of recipe variations make them eternally interesting. Some, as the Tuck Box scones, are served with butter and preserves. They are also often served in the British West Country with clotted cream and strawberry jam. But they can be served with everything from fruit to herbs and cheese. An Italian might make one into a mini pizza. For those who cannot get to Carmel very often, the Tuck Box sells their preserves including their famous Olallieberry version, their scone mix that dates back to 1949, their whole grain cereal (oats, wheat, barley & rye) and their Ceylon Pekoe Black Tea. Just call or fax the numbers below or log onto their web site. Dolores Between Ocean & 7th.